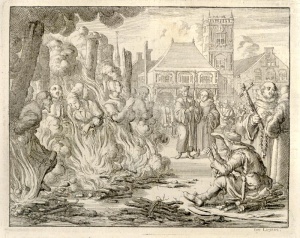 Burning of 6 brothers and 2 sisters, Amsterdam, 1549. Engraving by Jan Luiken in Martyrs Mirror, v. 2, p. 83 of Dutch edition. Barbara Thielemans (Tielmans), an Anabaptist martyr, was burned at the stake on 20 March 1549 at Amsterdam, along with seven others. According to the sentence, quoted by van Braght in the Martyrs Mirror, Barbara came from Dordrecht in the Dutch province of South Holland. She was baptized by Gillis van Aken. Concerning Barbara and her seven companions a song was composed, which begins "Tis nu schier al vervult ons broeders getal" (The number of our brethren, 'tis almost now fulfilled). It appeared in the Veelderhande Liedekens of 1556 and afterwards in later songbooks. The song consists of eight stanzas, the first letter of each being the initial of one of the martyrs. Verhooren en Vonissen der Wederdoopers, betrokken bij de aanslagen op Amsterdam in 1534 en 1535, in Bijdragen en Mededeelingen van het Historisch Genootschap, vol. XLI. Amsterdam, 1920: 155, 308. Wieder, F. C. De Schriftuurlijke liedekens : de liederen der Nederlandsche Hervormden tot op het jaar 1566, inhoudsbeschrijving en bibliographie : academisch proefschrift ... 's-Gravenhage: Martinus Nijhoff, 1900: See index on p. 193. Zijpp, Nanne van der. "Barbara Thielemans (d. 1549)." Global Anabaptist Mennonite Encyclopedia Online. 1953. Web. 23 Apr 2019. http://gameo.org/index.php?title=Barbara_Thielemans_(d._1549)&oldid=129131. Zijpp, Nanne van der. (1953). Barbara Thielemans (d. 1549). Global Anabaptist Mennonite Encyclopedia Online. Retrieved 23 April 2019, from http://gameo.org/index.php?title=Barbara_Thielemans_(d._1549)&oldid=129131. Adapted by permission of Herald Press, Harrisonburg, Virginia, from Mennonite Encyclopedia, Vol. 1, p. 232. All rights reserved. This page was last modified on 19 December 2014, at 08:39.